The cured-meat item in question is, as you might expect, not an ordinary one. For the 53rd Venice Biennale, which got under way last month and concludes in November, 500 of this particular kind of fat-studded salami were chosen to be more than just cold cuts by the Italian artist Maurizio Cattelan, known for provocatively funny work involving taxidermied animals and comical sculptures. They were elevated to the status of works of art — ready-mades in pig casing — in conjunction with a highly theatrical installation for the Nordic and Danish pavilions created by the artistic team of Michael Elmgreen and Ingar Dragset. The pavilion was transformed meticulously by the two artists into what looks like two well-appointed homes of wealthy collectors: one owned by a family that has put its just-so house and all its expensive artworks up for sale, the other owned by a novelist neighbor — apparently, judging from bits of evidence, a gay party boy — who is nowhere to be seen until you walk out the back of the house and see a body, presumably his, floating face-down in the pool. 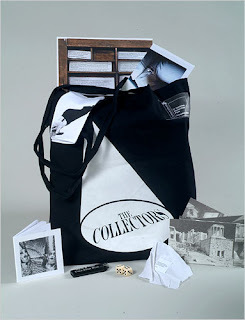 Called “The Collectors,” the installation became one of the more popular attractions during the Biennale’s opening days, presenting itself as a dark, funny post-mortem on the suffocating world of the international art-collecting class in an economy (once) run amok. In that spirit, actors posing as well-dressed agents for the fictional Vigilante real estate company handed out goodie bags to people who took a “buyer’s tour” of the family’s house. And unbeknownst to most of those who walked away with the bags, they contained much more than a tchotchke or a catalog. Maybe as a way of implicating the visitors as collectors themselves, the bags contained limited editions of small works by prominent artists like Terence Koh, Hernan Bas, Jonathan Monk — and Mr. Cattelan. And so began the unlikely questions at the intersection of art and salami. More than a decade ago the library of the Sterling and Francine Clark Art Institute in Williamstown, Mass., began to concentrate on collecting rare artists’ books and other, less conventional booklike works produced by artists around the world since the 1960s, and it has since built substantial holdings. In 2007 the institute decided it would be a good idea to begin gathering such materials at the Biennale; the Clark’s librarian, Susan Roeper, and her colleagues knew that these materials often turn out to be important and are very difficult to obtain from galleries or publishers after Biennales end. “The only way to get it, really, is to be there,” Ms. Roeper said. So in 2007 and again this year, the Clark asked Thomas Heneage, a veteran London art-book dealer, to be there in its stead, making his way through the Biennale as its personal catalog and art-book gatherer. When Mr. Heneage (whose wife, Carol Vogel, is a reporter at The New York Times) returned to his hotel room after a visit to the Nordic Pavilion, he said, he casually upended his goodie bag. 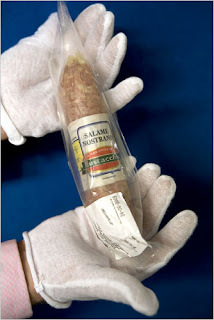 But after reading the materials in the bag and examining all the other tiny art objects, he realized he was in possession of a bona fide art salami, with potential historic value — especially because, he surmised, most people who came across their salamis would either eat them or throw them away. He quickly e-mailed the Clark with one of the strangest bibliographical communiqués he had ever sent. 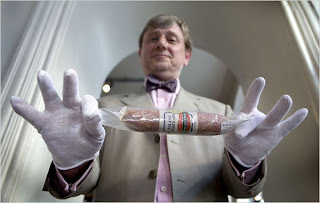 “It’s not every day you get to ask a museum library if they would like a salami,” he said. Asked how the salami would be stored in the library, Ms. Roeper said she hoped her conservation experts “could refer me to a good housing solution,” but added that she did not expect to be able to preserve it for decades, like a book. “Sometimes you just have to accept loss as the natural state of these materials,” she added. He added that if the Clark were unable to import the salami, he would happily go to Little Italy to buy a replacement.